Over seven million visitors take a trip to Krakow every year, though only a third or so stay overnight in the city. Many arrive and/or leave by air, but most take advantage of the fact that Krakow lies at a major European road and rail junction. Krakow’s John Paul II International Airport of Balice is situated conveniently on the outskirts of the city, just 15 km (about ten miles) from its center, by the A4 expressway to Silesia province (Slask) en route to Germany. One can easily get there by a shuttle train, car (the multilevel car park accommodates 1243 vehicles), taxi, or municipal bus lines 292, 208, and nightly 902 plus erratic other bus services. A shuttle train links the Krakow Airport with the city center. The Krakow international airport is Poland’s second busiest after Warsaw and may receive nearly eight million passengers a year. Krakow's John Paul II International Airport has regular direct air connections from and to major European hubs such Amsterdam, Berlin, Brussels, Copenhagen, Frankfurt, London, Paris, Rome, and Vienna, as well as Barcelona, Belfast, Bergen, Bologna, Cork, Dortmund, Dublin, Edinburgh, Eidhoven, Leeds, Lyon, Milan, Munich, Oslo, Stockholm, Stuttgart, and Trodheim. 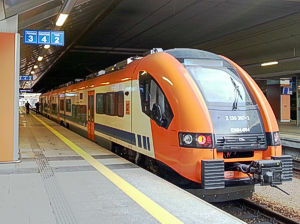 Transit connections via Warsaw link Krakow with New York, Chicago, Los Angeles and Miami in the USA, and with Bangkok, Cairo, Damascus, Dubai, Istanbul, Kiev, Larnaca, Lyon, Minsk, Moscow, Nice, Beijing, Riga, St. Petersburg, Vilnius and many other destinations. 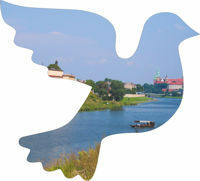 There are also domestic flights to and from Poland's capital city Warsaw. Such carriers as Air Berlin, Alitalia, Austrian Airlines, British Airways, Brussels Airlines, easyJet, Finnair, Germanwings, Jet2.com, KLM, Lufthansa, Norwegian, Ryanair, and Swiss fly passengers to Krakow besides the Polish national carrier LOT. Another international airport, i.e. Katowice Airport, is situated in Pyrzowice, some 105 kilometers northwest of Krakow. Journey to Krakow by road. Most people arrive to Krakow and leave it by car or coach thanks to the city’s abundant road connections. And no other major city in Poland can boast better accessibility from abroad. Krakow lies at one of key European crossroads, en route from the West via Germany to the East via Ukraine and from Scandinavia to the Mediterranean via Austria. The city’s main road connections include the A4 expressway to Germany, the no. 7 highway northwards to the Baltic Sea and south to the Mediterranean via Slovakia and Austria, the no. 4 highway to Ukraine, and the no. 52 highway to the Czech Republic (see the map). There are many permanent coach lines between Krakow and Western as well as Central Europe. Central bus depot is situated close to the Krakow Glowny main rail station that abuts the Old Town historic districts at northeast. Travel to Krakow by rail. Krakow is one of Poland’s main railroad junctions. Five trunk lines connect the city with the world. Its central Krakow Glowny station is situated most conveniently in the very city center, close to the Old Town historic district. Every day there arrive expresses from Germany’s Berlin, Austria’s Vienna, the Czech Republic’s Prague, and Hungary’s Budapest. Expresses run also to all major cities in Poland. Notably, most convenient is the shuttle express service to and from capital Warsaw where the 300-km trip takes 2h28 (Pendolino trains), no stops in between. At the same time there are abundant local rail connections.